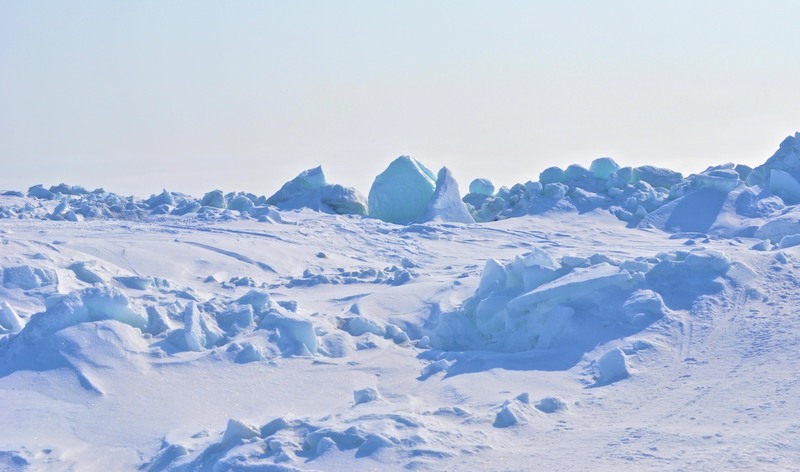 Two miles from land across the frozen Chukchi Sea, the ocean ice is constantly breaking up and reforming, creating ridges of fragmented ice. The blocks of ice in this photo weigh from hundreds to thousands of pounds, but are so clear they seem to be lit from within. 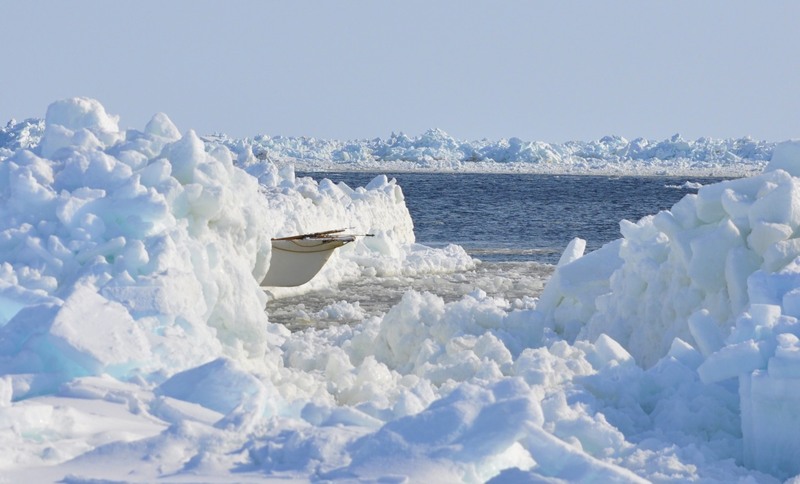 We had heard that the bowhead whale was out near the point, three miles west of the village of Point Hope. But once out there, we saw few signs of activity. We found a trail leading out onto the ice and began following it in hopes of locating the lead – the place where currents and wind had caused a break in the ice and created open water. That’s where the whaling camp would be. The ball and pyramid, above, were a familiar trail marker from a previous trek out onto the ice. 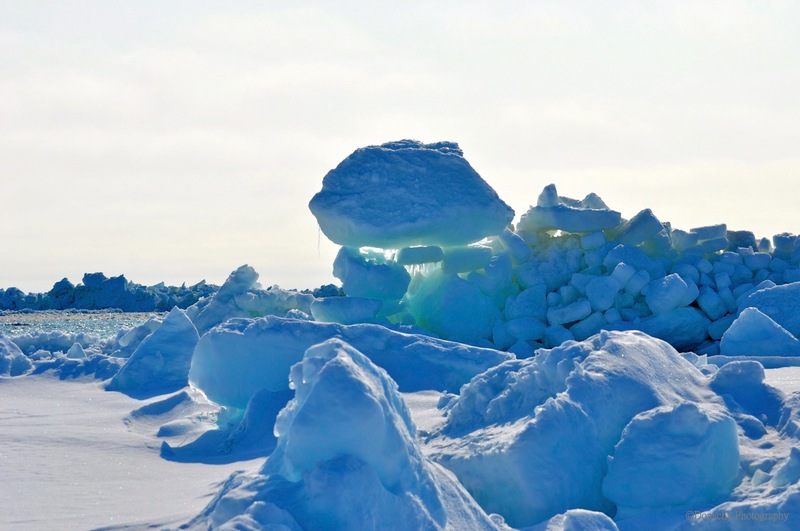 (Click here to see “Whale Camp: Frozen Sees and Icescapes.” A frozen sea is not smooth. It is more like an otherworldly, windswept rock and sand desert with the rocks replaced by ice and snow replacing the sand. Note the faint snowmobile tracks curving along the right edge of the photo – that’s the trail. A mile or more out on the ice, Barbra and our friend, Bill, pause to scan for telltale seabirds that might give away the location of the lead. This is an area frequented by polar bears, hence the gun Bill is carrying. We saw no bears, but did cross a number of fox tracks. Huge, luminescent fragmants of snow-dusted ice reminded me of the hardtack candy my grandmother used to keep in a crystal bowl. 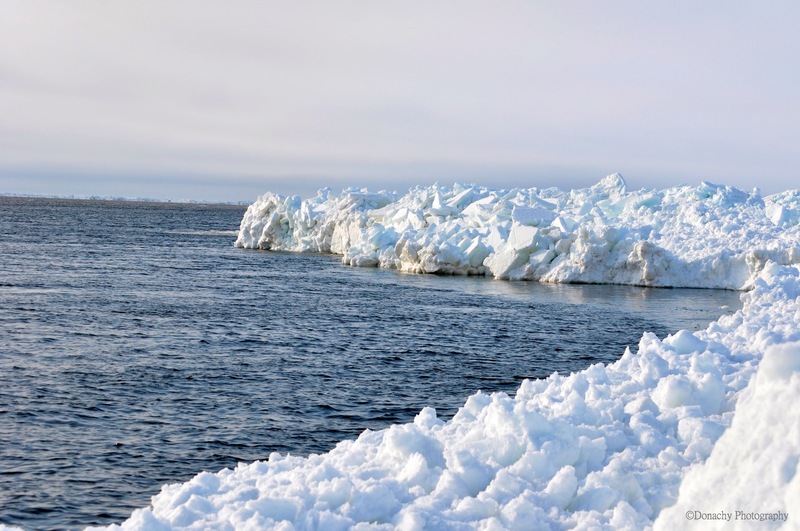 Leads can open and close in moments, leaving people stranded when a break-off occurs, or generating enough force to place this pickup-truck-sized block of ice precariously atop a mass of fragments. 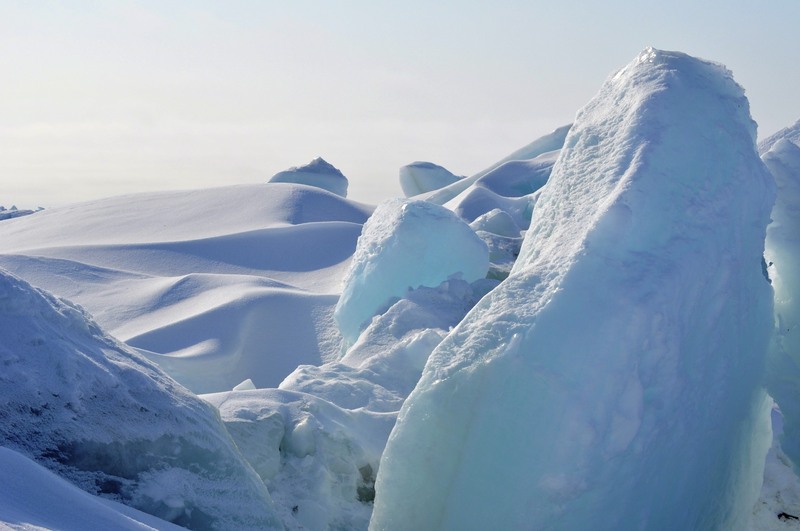 A walk across sea ice gives one a glimpse into the forces behind tectonic plates and events such as earthquakes and the formation of mountain ranges. We’d walked over five miles by the time we finally found the lead – a fairly narrow band of water hemmed in between two ice sheets. 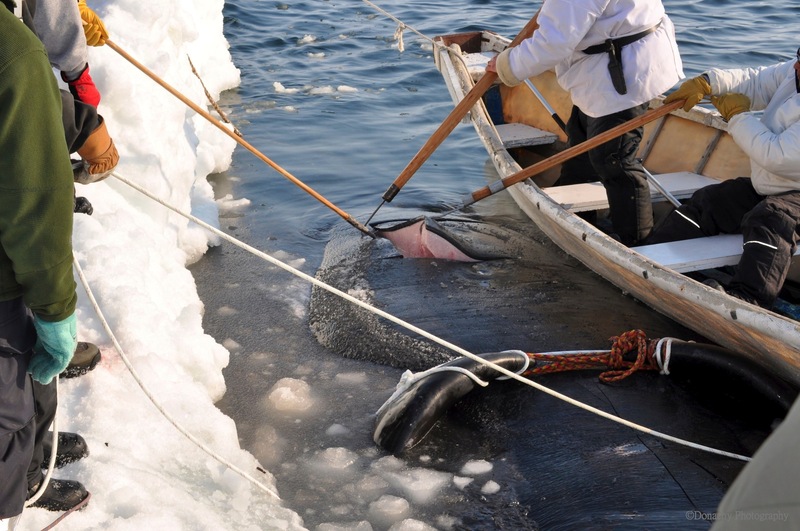 The bow of a seal-skin boat was a sure sign we were nearing the main whaling site. This is a typical whaling outpost. 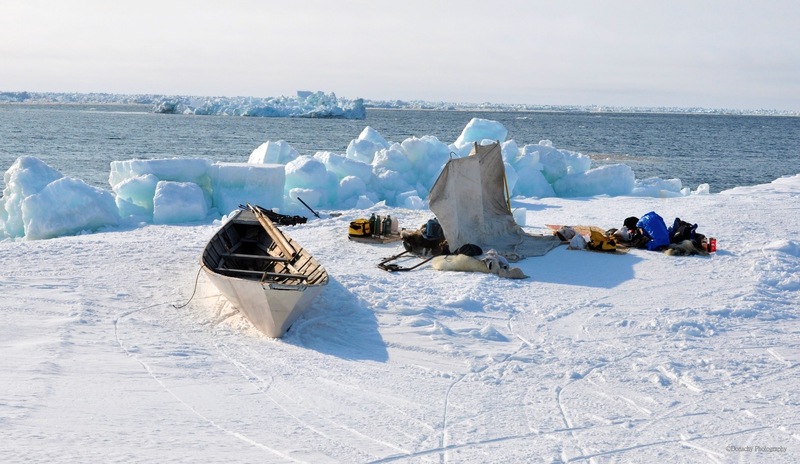 The seal-skin boat, which is about 17 feet long, is made from hand-stitched bearded seal hide. The boats are light, able to be moved on a moment’s notice. The jumble of ice at the edge of the lead was piled there by natural forces and serves as both wind shield and hunting blind. Note the mass of floating ice out on the water. At the edge of the lead, the ice does not taper. It is thick and strong, but susceptible to breaking off if the wind shifts. We had wondered how a whale weighing 10, 30 or even 50 tons is pulled from the water. Two heavy block and tackles are anchored to the ice. The one nearest open water is pegged with a thick metal spike. Fifty yards or so back a second block and tackle is anchored by drilling two holes through the ice and securing the it with a strong harness. 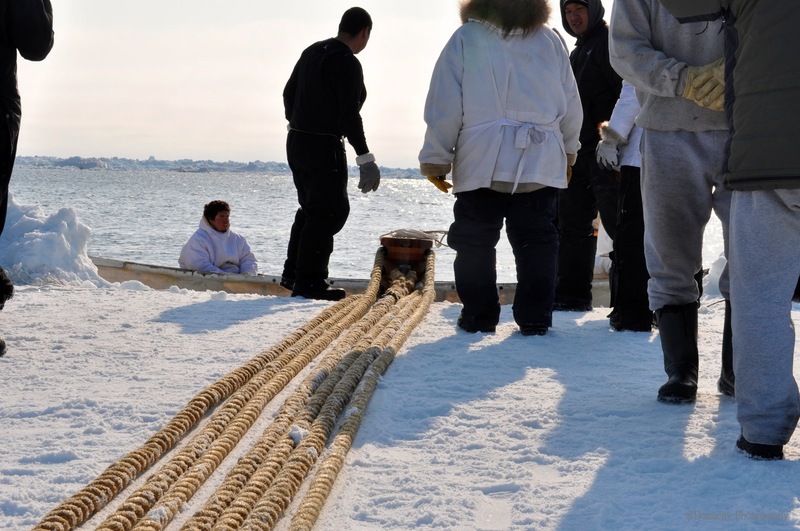 Even with the modest mechanical advantage of pulleys, it takes dozens of people pulling for all they’re worth to bring the whale out of the water. Most of the tools used are hand-crafted. The spade-like implements on the right are butchering tools. 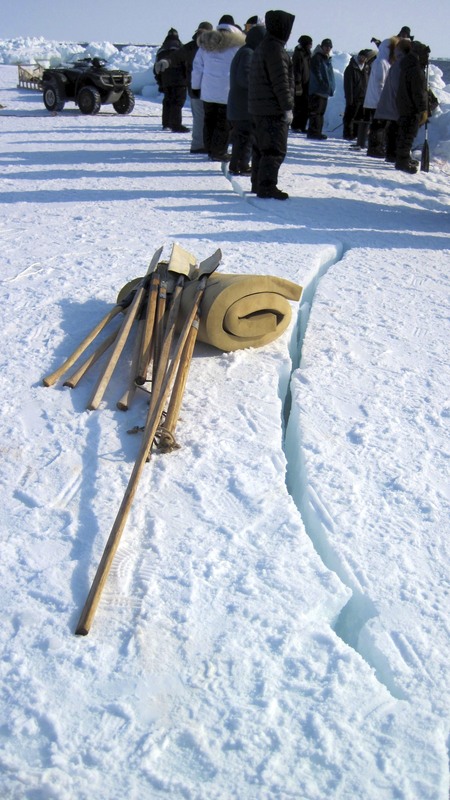 We were very aware of this deep crack in the ice, as, no doubt, were the whaling captain and his crew. While the ice to the right of the crack was sturdy enough to support a house, a shift in the wind could have caused it to suddenly break off. The whale was small, a young one. Here a ceremonial first piece weighing 30 pounds or more is cut for soup in which the only ingredients are melted snow and fresh whale – a welcome celebratory meal against the cold. When the pull began, I handed my camera to Barbra and found a place on the rope. The pull started with grunts and chanting, but as the whale begin to emerge from the sea onto the ice, the chanting gave way to whoops of joy and cheers. …and then his crew member headed off with a friend for a bowl of hot whale soup. By this time, Bill, Barbra and I had been out on the ice for nearly five hours and we had a two-mile hike back over the sea to land. 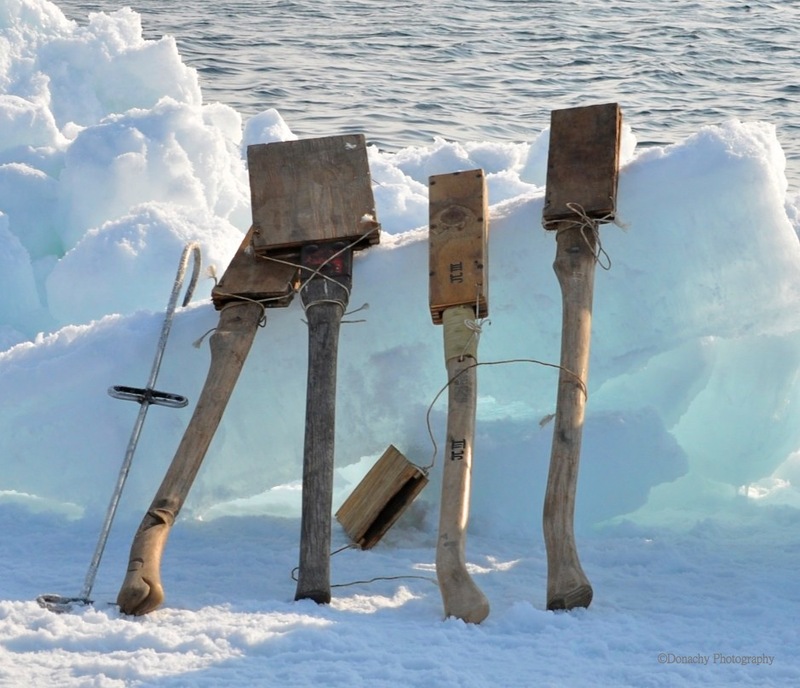 We were thrilled to have witnessed and taken part in a tradition that goes back to the roots of this Inupiat village. Just facinating….Thank you for sharing! 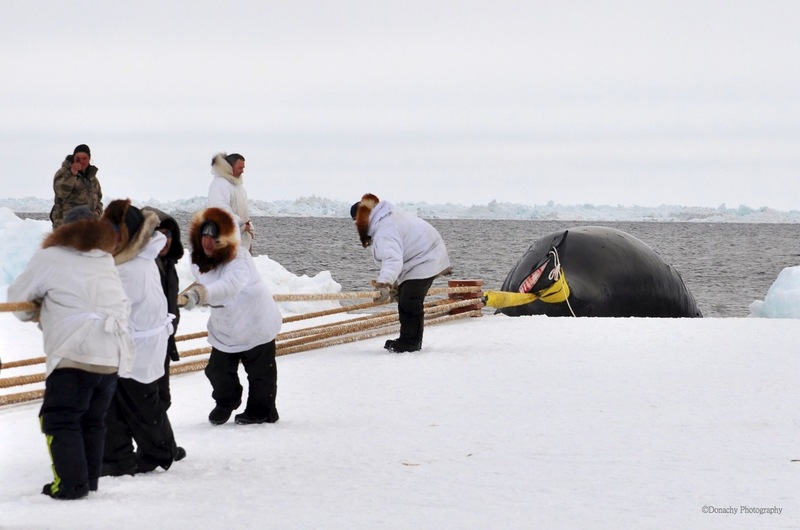 We learned a lot from this experience, starting with how they pull a whale up on ice. 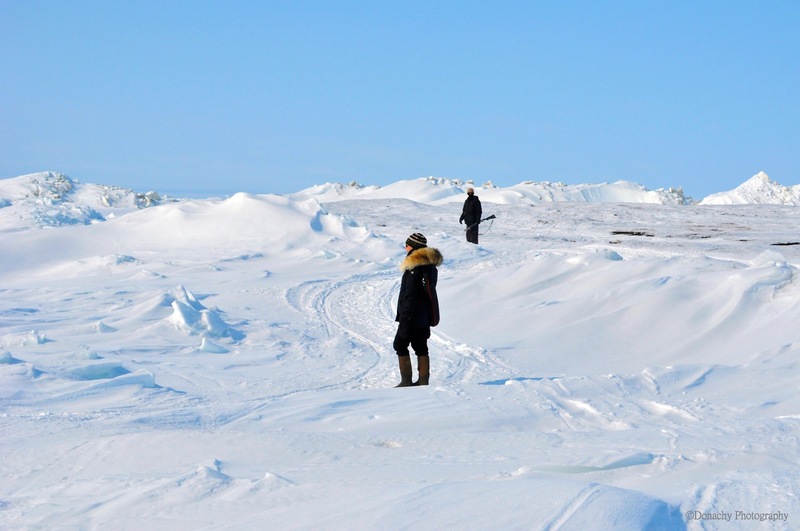 And we never imagined that one day we’d take a 4-mile round trip hike on sea ice! Dear Barbara and Jack, I mentioned my experiences at Pt Hope 1966-67. The whaling technology and scenery are just the same, so reminiscent! Please say hello to John Oktollik our captain, Elizabeth Kubanyi (Tyzroyluke), Seymour Tyzroyluke Jr, Henry Attungana, Andrew Tooyak Jr (I still have a little polar bear he carved) so more many remembered students and villagers..
Marcia, Thanks for reading. It’s wonderful to hear from someone who has ties to this beautiful village. We will indeed give your “hello’s” to the folks you mentioned. What an interesting experience and makes me think that I take my weekly grocery trip for granted at times! Great photos – thanks for sharing! Were these just taken recently? 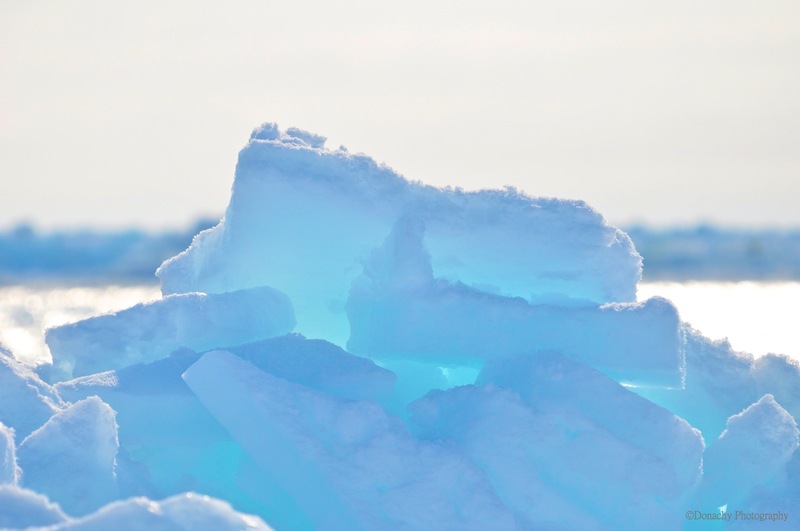 The ice is very pretty…when will the sea ice begin to melt? These photos were taken April 26. I think the ice starts to go in a few weeks… mid-May or around there. I dream of taking pictures as beautiful as these. Thanks for sharing your awesome experience so beautifully. Fasinating and educational. Thank you for putting up posts about your life. The pictures are amazingly beautiful. I lived in Alaska for 3 years. DID NOT want to leave but my sister had just had a baby and I ended up back in the lower 48. And then life sometimes takes on a life of its own and I’m still here. I think about my time in Alaska every single day and swear to get back up there and homestead. The Anthropology of Native Alaskans was my all time favorite class at UAA so this post brought back all kinds of memories! I loved it!! Thank for reading, Jennifer. We love the theme of your blog! Aw, thanks. It’s so much fun trying to reduce. As crazy as it sounds, I don’t remember when I’ve had this much fun. It was probably in Alaska! ha! I subscribed to you and cannot wait to show my husband your posts. My goal is to get him up there. I just KNOW once he goes, he won’t ever want to come back. I didn’t!! Yeah, that’s what happened to us. We came up here for a summer vacation and never wanted to leave! So we found jobs up here, and love that we came up. Glad to hear you were both able to find jobs. I cannot wait to hear your stories as they unfold! !